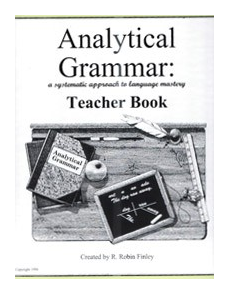 Analytical Grammar uses a unique method of teaching grammar, which starts from "ground zero" - assuming that the student knows no grammar - and continues on from concept to concept, until the entire body of knowledge which we call grammar is covered. 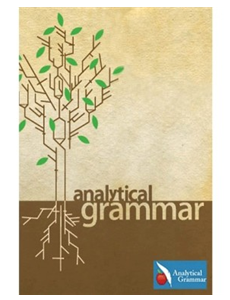 Visit the Analytical Grammar website for more information. 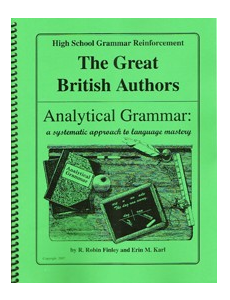 Watch Analytical Grammar's videos to see how it works. 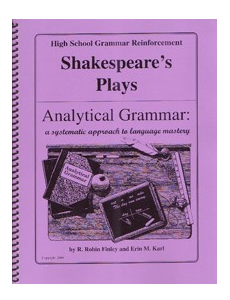 Read Analytical Grammar's FAQ page. 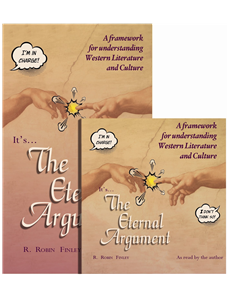 Check out reviews for Analytical Grammar, Beyond the Book Report, Junior Analytical Grammar, and The Eternal Argument. 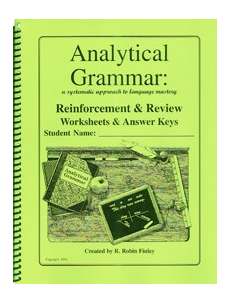 Fulfillment: Your Analytical Grammar product will ship directly to you from the Analytical Grammar warehouse. You will receive an email from us when your order has shipped which contains your tracking number. You will receive your SmartPoints within 10 minutes of placing your order. Shipping: Shipping is FREE for US orders only! Your order will ship from Analytical Grammar via USPS Media Mail. Please allow 5-14 business days for delivery. Returns/Cancellations: If you are not completely satisfied with your Analytical Grammar products, you can request a full refund if you do so within 30 days of the date of purchase. Submit your cancellation request at our Contact Us page. You will receive return instructions via email and/or phone. * Free shipping to U.S. and military bases only. Includes one student workbook and one teacher book. This does NOT include the Reinforcement and Review book you'll need if you break the program into 2 or 3 years. That book is sold separately below. 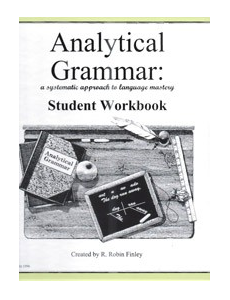 Analytical Grammar is a program that teaches English grammar, punctuation, and usage. It is designed to be taught in three grammar seasons (see timeline) over three years; however, it is flexible enough to be adapted to a one- or two-year schedule. AG has been successfully used with all students from the learning disabled to the highly gifted. 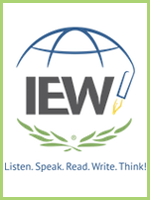 This innovative and logical method is not only extremely effective, but makes learning grammar fun. 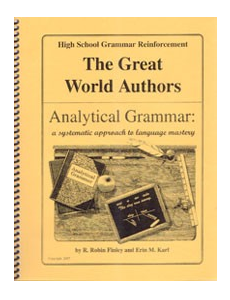 Analytical Grammar is an easy-to-follow, step-by-step approach that will prepare your student for high school and college-level work. The home teacher does not need to be a grammar expert but can learn right along with the student. An optional Review and Reinforcement workbook to keep skills sharp between "seasons." 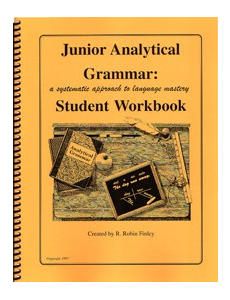 Extra Analytical Grammar Workbook (each student needs his or her own workbook.) 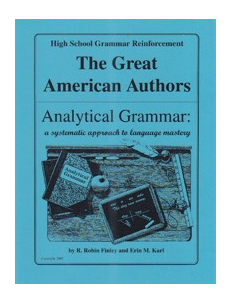 If you do not yet have a teacher book, be sure to order the "Set of Analytical Grammar." You need to have the teacher book! This DVD set features the authors of AG teaching each unit and practicing a few sentences from the worksheets. 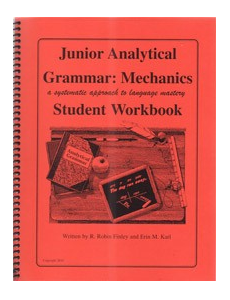 Extra Jr. Analytical Grammar Workbook (each student needs his or her own workbook.) 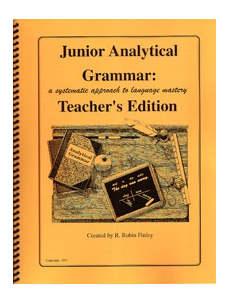 If you do not yet have a teacher book, be sure to order the "Set of Jr. Analytical Grammar." You need to have the teacher book! This DVD features the authors of Jr. AG teaching each unit and practicing a few sentences from the worksheets. 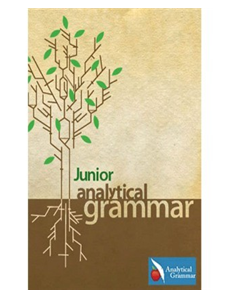 Junior Analytical Grammar: Mechanics has been written in response to frequent requests from our customers for instruction in punctuation, capitalization, and usage designed for children younger than those who are in the third "season" of Analytical Grammar. Many punctuation rules are based on a knowledge of advanced grammar, such as is covered in the second "season" of Analytical Grammar; however, we have pulled together those punctuation, capitalization, and usage rules which students with a thorough understanding of basic grammar can comprehend. 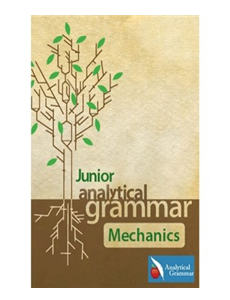 Jr, AG: Mechanics consists of 15 weeklong units and is recommended for students who have completed either Junior Analytical Grammar or the first "season" of Analytical Grammar. 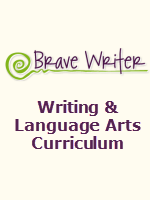 As is the case with all our grammar instruction, each unit builds on the previous one in a "spiral" approach. Each student needs his or her own workbook. If you do not yet have a teacher book, be sure to order the "Set of Jr. AG: Mechanics." You need to have the teacher book! This DVD features the authors of Jr. AG: Mechanics teaching each unit and practicing a few sentences from the worksheets. 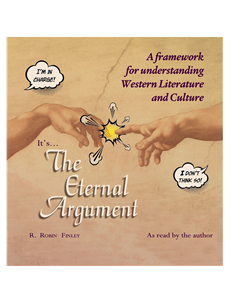 A nine-disc set of The Eternal Argument, read by author Robin Finley. The audiobook version is great for allowing the whole family to listen to the book together. Perfect for a car ride! 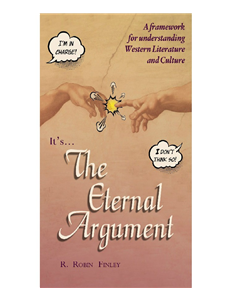 With great humor and many excellent examples from literature and history, this book explains this framework which will make reading and teaching literature a more meaningful endeavor. This special price gets you a paper copy (for dog-earing and note-making) as well as the audiobook (for car-listening and family -learning). Season One of Beyond the Book Report contains three separate units that begin building a foundation for meaningful literature study and written response. You'll receive a DVD with printable files and video lectures as well as a teacher guide. BBR takes the student and teacher step-by-step through the entire process. 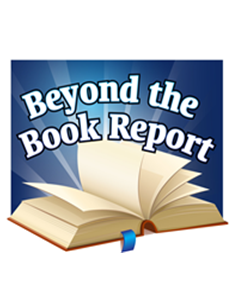 Season Two of Beyond the Book Report contains two separate units that cover poetry and drama. These add to the season one foundations of literature study taught in season one. You'll receive a DVD with printable files and video lectures as well as a teacher guide. BBR takes the student and teacher step-by-step through the entire process. Season Three of Beyond the Book Report contains three separate units that cover essays, oral reports, and research papers. These add to the foundations of literature study taught in seasons one and two. 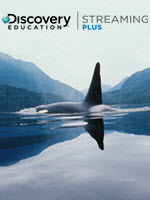 You'll receive a DVD with printable files and video lectures as well as a teacher guide. BBR takes the student and teacher step-by-step through the entire process. Season Three is the longest season. There are three sections. The essay and research paper sections will take our existing Teaching the Essay and Teaching the Research Paper units, expand them, and add a video lecture component. 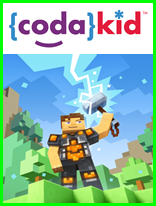 This is a bundle price for all three seasons of Beyond the Book Report. See the above products for descriptions of the individual seasons.